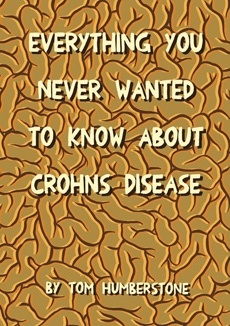 “[Crohns] was ” he said “generally a subject I avoided talking about and would rarely, if ever, mention I had it. What was so interesting about producing the comic was that I felt I’d communicated what it was like to have Crohn’s quite successfully and when it was published on the internet for anyone to see, it felt incredibly liberating. This doesn’t seem surprising to me. I think the power in a comic like this lies in it’s deeply personal narrative. There is no intention to preach, teach or claim authority. It is simply a musing on how the illness affects the author, with acknowledgement that others have had it worse. Comics like this should be gold dust to healthcare professionals, reminding us that ‘diseases’ are infinately variable and personal, rather than the abstract entities related by textbooks. It has been used on a few websites dedicated to Crohn’s and Colitis but deserves wider recommendation by healthcare professionals. Humberstone developed Inflamatory bowel disease at the age of 11. He portrays himself As a child, hamster-cheeked as a result of steroids. As we follow his progress through investigations to diagnosis he is sedated to undergo a colonoscopy but runs amok and gets a dressing down from the doctor (a cameo ‘played’, It seems to me, by Scott McCloud) for swearing at the nurses. The condition is brought under better control as he gets older but there is no doubt of the havoc it wreaks on his daily life. The comic is funny, and self depreciatory, which renders the author’s appology for his ‘self-indulgent confessional’ unnecessary. Metafictional elements abound: we follow Tom through his 24 hour comic making marathon, his ‘avatar’ becoming more tired and sleepy-looking as time goes on. He is an acomplished draughtsman: the artwork is all brush lines and inky washes, with hand lettering in what looks like technical pen. The constraints of the 24 hour challenge have lent it a spontanous, slightly raw, quality which is appealing. The last printed copy of the book has just sold, but the good news is you can still access it for free on Tom Humberstone’s blog.